Hyundai has been building towards it in the Australian market for years. 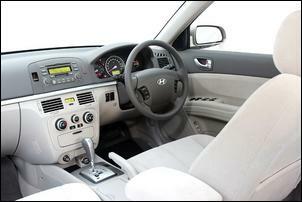 The original Grandeur was flawed but showed promise with a sweet engine and 5-speed auto. The new diesel turbo engine in the Terracan is a smooth, powerful and fuel-efficient design – although the rest of the car now feels quite old. And at the budget end of new car buying, there’s little wrong with the Getz. But with the new Sonata, Hyundai has the killer punch – an extraordinarily good engine and transmission absolutely at home in a modern, roomy and highly competent body. Why buy a $37,000 V6 Honda Accord when you can have very similar power and economy, better handling, more features, a longer warranty – and pocket a heap of cash? Even when viewed only on paper, the Sonata is stunning value: a 3.3-litre V6 engine with 173kW yet still giving ADR 81-01 combined city/highway fuel economy of 10.1 litres/100km. Factory listed performance that includes a 15.6 standing 400 metres (yep, mid-fifteens from a naturally aspirated family Hyundai!) and a 0-100 km/h time of 7.7 seconds. Significantly, in our testing we bettered both the fuel economy and 0-100 km/h performance figures. Completely standard – even in this base V6 model – are ABS, traction control, Bosch 8.0 stability control, a sequential 5-speed auto, 16-inch rims (although they’re steel) wearing 215/60 tyres, six airbags (including standard side curtain ‘bags), and Sachs-equipped double wishbone front suspension and multi-link rear suspension. And if anything, that spec list understates the sophistication with which the Sonata drives. Make a few minor dress-up changes to the interior, perhaps soften the suspension a tad, and you could very easily be in a car with a mid-$60,000 price tag. But the unbelievable thing is that the list price for the Sonata is just $29,990! Even as I type that figure I need to open another screen to again check it against Hyundai’s press material... surely there’s never been a bargain like this? Of course, the Sonata isn’t perfect. We found some interior plastic fittings that looked a little tacky (the fuse cover at the end of the dash is one) and the front suspension of the test car had a clunk on sharp low-speed turns. 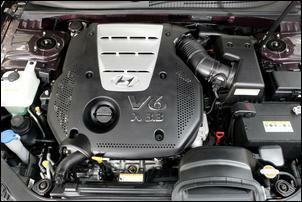 There was also an odd resonant buzz from under the bonnet when engines revs rose at a slow rate. However, the biggest negative is the suspension, which we think is simply too firm for a family car. If this were the sports version (and no such model exists, the only other V6 is the better equipped Elite), the suspension would be fine as it is. But all Australia Sonatas get the European suspension pack, and while it’s much preferable to the ultra-soft suspensions Hyundai has previously given us (the Grandeur comes to mind), on some of the goat tracks that pass for roads in this country it can be a bit uncomfortable. But first and foremost this is a family car. Inside it’s huge – sure, not as big in every dimension as the local Falcons and Commodores but still plenty spacious for four adults. Set the driver’s seat for a comfortable, tall person driving position and directly behind there’s still plenty of room in every direction, save perhaps for headroom if you’re very tall. And inside the cabin it’s not just a big volume. Intelligent design abounds, with plenty of storage spaces, a roof-mounted sunglasses holder, cup-holders in the fold-down rear armrest and in the centre console, a slide-forward central front armrest, and extendable sunvisors. The seats are comfortable and well shaped, with both front seats providing adjustable lumbar support and both able to be adjusted for height. Unfortunately, the seats pivot around a forward point, so in effect only the rear of the seat is able to be lifted. The rear seat split-folds, allowing long objects to be carried. 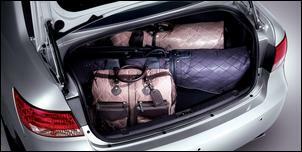 The boot volume itself is huge at 462 litres, although the opening is limited if box-shaped objects need to be placed inside. A 12V power socket is provided in the boot and the lid is hinged with gas-strut equipped external hinges that don’t intrude into the boot space when the lid is shut. The front seat head restraints are equipped with an active anti-whiplash mechanism which in a rear-end collision pivot the head restraint forward and slightly upward. In addition to height adjustment, the front head restraints can also be adjusted for fore-aft position. In-cabin equipment includes an LCD average fuel consumption display (it’s integrated into the trip meter), straightforward rotary control heating and air-conditioning controls, and an MP3-compatible AM/FM CD sound system that uses steering wheel mounted controls and sounds a long way better than class average. And on the road? Well, the good news story continues. The engine is a creamy delight, smooth, powerful, unfussed, torquey, responsive, tractable.... you get the picture. It makes the performance of Holden’s recently introduced Alloytec V6 engine look like a joke; shows the age of the Camry’s (still very good) V6; together with its 5-speed auto is clearly superior to the Falcon in-line six and 4-speed auto combination; and is simply in a different technological millennium to the Magna V6 (and, apparently, the soon to be released 380’s engine). In fact, we’d be happy pitching it against the Maxima’s 3.5-litre V6 and the Honda Accord’s 3-litre V6 as one of the best passenger car six cylinder engines in Australia – and the cheapest Maxima is $38,990 and the Honda starts at $36,990! The 5-speed auto – like the engine, another all-new design – is well up to task. It picks up lower gears with ease, integrates superbly with the engine on full-throttle changes, and allows easy driver selection of gear. But the reality is that perhaps with the exception of engine braking on long descents, or if powering the car along a twisting mountain road (Huh? We’re talking a Hyundai Sonata here? Just go try it! ), you’re very unlikely to ever manually change gears. Perhaps the only criticism that can be levelled at the engine/transmission combination is a slight jerk that can occur when getting back on the power. And the handling? It’s certainly no let-down – and it’s heaps better than the grossly understeering V6 Accord – but by the same token it’s not nearly as good as a Commodore, Falcon or all-wheel drive Magna. The standard stability control stops it getting ugly but the Sonata will certainly understeer until the Bosch system grabs it by the neck and reins in the front slide. That’s written from the sporting perspective of a mid-fifteen second quarter mile car being driven hard; for family and the vast majority of normal driving, the Sonata is stable, forgiving and telegraphs its behaviour well. The NF Sonata is a watershed car for Hyundai – and perhaps the rest of the market as well. 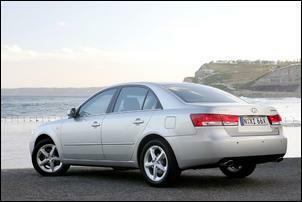 The Sonata was provided for this test by Hyundai Australia. Footnote: Journalists who attended the press launch of the Sonata were offered cars at half price. After the resulting outcry over the inappropriate influencing of journalists with what amounted to a bribe, the company later withdrew this offer. Julian Edgar did not attend the press launch and no offer was made to him.